Jesus, churches, god, idiocy, omniscience, vaccines and more! The return of Jesus - Not really, but a return of a proselytizer. Tax the Churchs! - The pro- and con-discussion is taxing. They’ve got it right - How can you hate something you don’t think exists? Unbelievable idiocy - Not the story itself, but the lack of skepticism or investigation. Editor’s Choice: The Mythicist position - Now random numbers versus omniscience. PBS FRONTLINE: The Vaccine War — The show pretty much lays out the controversy over childhood vaccination and the problem we all face as the mostly parent driven movement of anti-vaxers grows. Watch the full program online. From its beginnings rising from the now discredited and retracted Lancet published study by Andrew Wakefield that linked autism to the mumps-measles-rubella vaccination (MMR), the subsequent studies that showed no link whatsoever, through the moving of goal posts by the anti-vaxers to now include all vaccinations as being more dangerous (and yes, still causing autism) than not being vaccinated (what’s worse, measles or autism?) at all. Also at issue are parents claims that they would be denied a basic freedom over themselves and their right to protect their children as they see fit if they were not given the choice to vaccinate or not. Vaccines have changed the world, largely eradicating a series of terrible diseases, from smallpox to polio to diphtheria, and likely adding decades to most of our life spans. But despite the gains — and numerous scientific studies indicating vaccine safety — a growing movement of parents remains fearful of vaccines. And in some American communities, significant numbers of parents have been rejecting vaccines altogether, raising new concerns about the return of vaccine-preventable diseases like measles and whooping cough. 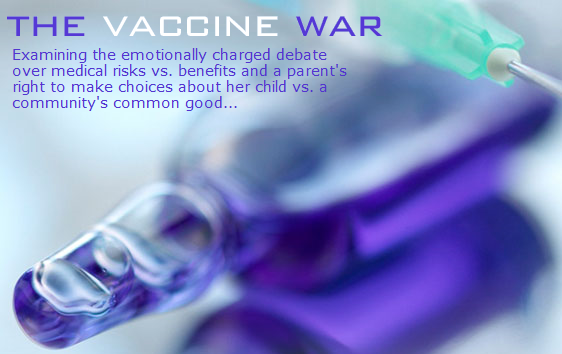 In The Vaccine War, FRONTLINE lays bare the science of vaccine safety and examines the increasingly bitter debate between the public health establishment and a formidable populist coalition of parents, celebrities, politicians and activists who are armed with the latest social media tools — including Facebook, YouTube and Twitter — and are determined to resist pressure from the medical and public health establishments to vaccinate, despite established scientific consensus about vaccine safety. “Scientifically, I think the matter is settled,” says Anders Hviid, an epidemiologist at the Statens Serum Institut in Denmark. In one of the largest and most comprehensive epidemiological studies available, Hviid and colleagues analyzed data on more than a half million children and found no link between the MMR “triple shot” for measles, mumps and rubella and an increased rate of autism — a link that’s been strongly asserted for years by anti-vaccine activists. Similar epidemiological studies in Denmark also failed to reveal a link between the mercury preservative thimerosal and autism. In fact, around the world, peer-reviewed epidemiological studies have found no link between autism and either the MMR shot or thimerosal. Surveys reveal that America’s conversation about vaccines is complex, involving not only medical risks and benefits but also ideological beliefs about parental choice and the limits of government. “This is true even of individuals who see the benefits of vaccines as substantial,” political scientist Hank Jenkins-Smith tells FRONTLINE. “They still want it to be a choice. They don’t want it to be compulsory.” Government control over individual choice is another factor fueling the anti-vaccine backlash, despite the peer-reviewed science that vaccines are safe. A discussion is included on the website as well as interviews with some of the major players and a Dotors and Viewers forum. There is also a resource and link page. Pretty much, the subject is covered. Please visit PBS FRONTLINE: The Vaccine War and watch the video, check the links and maybe, take part in the ongoing discussion over there. It is said to await certainty is to await eternity. Wednesday the 15th: Well, by golly, we had a pretty decent chat. Talked about cultural constructs and how women are still treated as professionals. Men still earn roughly 20% more than woman doing the same jobs. That happened to be a pretty lively discussion because some sexist attitudes toward women and men are so ingrained in us by way of our culture, that even those who advocate for women (or men) often aren’t aware of our own sexism. Cultural constructs are a hard nut to crack. Both sexes play their roles without being aware that what they are doing is perpetuating what is mostly an artificial idea of what our roles are. Anyhow, if there was anything else of import talking about in chat, I don’t recall it because no one was logging chat this week. Oh wait! I ordered out for a pizza delivery during chat because I didn’t want to leave my post. And what do you know? For the first time Domino’s let me down. It took them over an hour to make the delivery, and by then, chat was over! So there you go. Wednesday the 22nd: We started with a TAM-9 countdown. It’s close now… Kil got into trouble when an HOA condo board wouldn’t pay for work he did, and a small claims court won’t have time to process the claim in time for TAM or rent. The over-all economical situation was also discussed and not surprisingly, Teabaggers got a lot of blame. We also discussed Presidential elections, the latest and a few before that, and how some of them were potentially rigged. A theory was proposed that Republicans voted for Obama because they were scared of Palin. The Jewish-dog-stoning-story proves that journalism is a shadow of its former self. Popper vs Kuhn and the battle to understand how science works. Vaccines and Your Child: Separating Fact from Fiction, by Paul A. Offit and Charlotte A. Moser. There were 6,246 daily visitors this week.